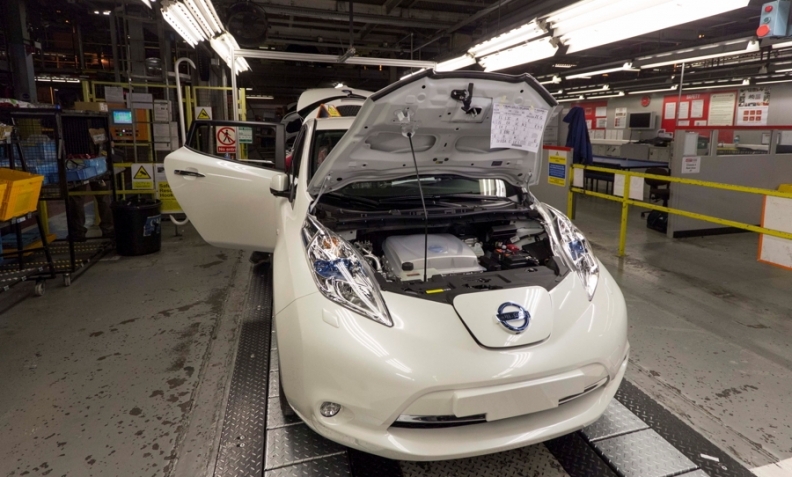 Nissan produces the Leaf and the electric car's batteries at its plant in Sunderland, England. TOKYO -- Nissan Motor Co. is discussing with Panasonic and other companies, including Chinese firms, the possible sale of its controlling stake in a car battery manufacturing venture, the Nikkei daily reported on Friday. Nissan wants to sell its 51 percent stake in Automotive Energy Supply Corp., which is jointly owned by NEC Corp., because it would be cheaper to buy batteries for electric vehicles such as the Leaf from other producers, the newspaper reported, without saying where it obtained the information. The report "is speculation, and is not based on any announcement by us," Nissan said in a statement. Spokesmen for Panasonic and NEC declined to comment. Nissan and Renault, under Carlos Ghosn, who heads both companies, have bet more heavily on EVs than mainstream competitors. In 2009 the two companies pledged to invest 4 billion euros ($4.46 billion) to build EVs such as the Nissan Leaf compact and as many as 500,000 batteries per year to power them. Sales of the Leaf and other EVs, however, have been disappointing, meaning Nissan and NEC have been unable to lower battery costs through mass production.